Is Your Plan for Offsite Backup Working? There are dozens of file storage products for SMBs. Some of them are small systems sold in retail stores that lack the reliability and features required for business. Other larger ones provide expandability but often have many features that will never be used. What they have in common is that they are all complex to configure and manage. Drobo® model B800fs with Drobo Sync gives you offsite backup with start to sync in 5 clicks! Drobo Sync is the data offsite backup/replication tool integrated into the Drobo B800fs via Drobo Dashboard designed to provide simple, fast, and reliable data replication for your small business. Simple to set up, simple to use, and reliable, Drobo Sync seamlessly replicates your data to another Drobo B800fs on your network or VPN ensuring data availability in case of disaster. Odds are that your business is not regularly testing your ability to recover from a disaster. Businesses of all sizes back up their data, but it's not perfect, even in large enterprises. Most business managers do not know how complicated and risky the recovery process is. IT managers that regularly test recovery know that it fails more often than not. Complexity is the reason recovery is not as quick and reliable as it should be. Whether companies have ten or ten thousand employees, they still need fast and reliable recovery. Historically, businesses have used offsite tape vaulting to ensure that backup data is not lost in the event of a disaster. Recently, cloud-based backup has gained visibility as an approach for getting data offsite. Both offsite vaulting and cloud backup are limited in their ability to recover quickly. For vaulting, tapes must be transported and restored. With cloud backup, data can be available immediately, but transferring very large amounts of data from the cloud can take hours or even days. These recovery times are not acceptable, as business users have come to expect nearly instant recovery. Replicating files between sites can serve as an automatic offsite backup to enable very rapid access to files and restoration of file data. At a basic level, say for SMBs, only new files or changes in existing files are copied to the secondary site. The sync operation can be regularly scheduled during off-peak hours or several times during the day—it can also be started on demand. Users at the primary site continue to access file storage the way they are used to and the device at the remote site serves as a duplicate copy of the primary. This way configuration and maintenance of the offsite backup is simplified, which is even more helpful when it comes to fast recovery. Like cloudbased backup, individual files can be accessed from offsite storage. Unlike public-cloud backup, offsite backup with file replication allows for rapidly redirecting users to the secondary site in the event of a disaster—and the secondary is an exact replica of the primary. This solution serves as "private cloud" infrastructure, and many service providers can host the secondary storage device if no other suitable site is available to users. Comparing file replication with other approaches to offsite backup. Turn on secondary Drobo model B800fs, run scheduled or ondemand sync, and you have offsite backup! Test your recovery plan, it can be as easy as redirecting users to the secondary Drobo. Tested solution protecting data at primary and secondary sites. There are dozens of file storage products for SMBs. Some of them are small systems sold in retail stores that lack the reliability and features required for business. Other larger ones provide expandability and often have many features that will never be used. The problem with all of them is the complexity of configuring and managing the storage and the offsite backup features. Even storage products for consumers can be nearly impossible to configure and use. Drobo model B800fs with Drobo Sync gives you offsite backup with start to sync in 5 clicks! Drobo provides superior data protection with BeyondRAID technology in a package that is very affordable for business. Compared with the cost of cloud backup or offsite tape vaulting, customers can buy the two file storage devices they need for offsite file replication often at less than half the cost. Simplicity can be more important than cost, as predictable recovery from a loss for a small business can only come from a backup strategy that is easy to set up and maintain and enables rapid recovery. 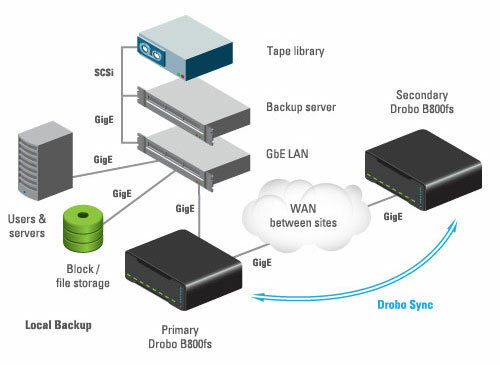 Offsite backup with Drobo is the perfect choice for SMBs.